Welcome to AskAW! This section of our web site lets you submit questions about any problems/queries that you may have about Windows. Be it from a little icon that annoys you to hardware freezing your PC, we will try and help you out. 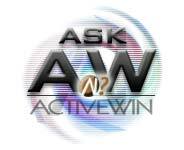 You can submit your questions by e-mailing us at askaw@activewin.com. You can browse through previous questions over at our Archive Page. Who knows what you might find. Hi, we have a Server based on win2000 server that has a lot of problem, so we need to format and reinstall ex-novo the OS, but we haven't a backup server so we need to import in the "clean" system the actual domain user. Do you know how is possible to reinstall all the actual domain users defined in our LAN? If we loss this information even the client will not be able to recognize the "old" users, so a "new" profile will be created, the crypted file will be loss and so no. Please let me know asap. 2. Make it a domain controller by running dcdpromo.exe from the start / run command line and select to install it as an additional domain controller. 3. Reboot the machine when asked to. 4. Wait for approx. 30 minutes so you are sure that every bit of AD information has been replicated to the new machine. 2. You'll get a new command prompt (it's a command-mode program). 4. Type connect to computer <you want to transfer the roles to> and press enter. 5. Type seize PDC and press enter. You'll get a confirmation box. Press "yes". Don't worry if the system return some "garbage you don't understand or gives errors. 6. Type seize RID master and press enter. 7. Type seize schema master and press enter. 8. Type seize infrastructure master and press enter. 9. Type seize domain naming master and press enter. 1. Install DirectX 8.0 from www.microsoft.com/directx. 2. Use your Windows Update feature from your start menu once in a while to upgrade to the latest service packs, hot fixes and compatibility files. Especially the latter have been created to let a huge number of games run on Windows 2000. If these steps don't work, go to the folder's) where you think the installation files have been put and see if there's some program that lets you manage these files (i.e. burn them to CD or so). If it turns out they are already a copy of the CD, just burn it to a CD and you can then install win 98. I am student from one of the local university in Malaysia. I'm taking operating system course right now and handle for the assignment which related with the topic windows 2000 for aspect operating system. I have attempt to find the information through Internet but I can't get the appropriate information that I wish to get. So, I wish to get your attention to help me to obtain that information. There are: -device management -memory management -file management -process management I hope that I can get the information today as my assignment have to pass up before date lie. I will appreciate for your willingness to help me. Thank you. There are a number of online resources which will help you with your assignment. The first place that I would look is http://www.williamstallings.com/OS4e.html. William Stallings has written a very good article on Windows 2000, from a Computer Science perspective (it's in a PDF on that page). He has also put an article on UNIX on that page. This will be useful to contrast Windows and UNIX. The next place to look would be http://www.sysinternals.com. This site is run by Mark Russinovich who was a co-author of Inside Windows 2000. He has also written articles for Windows 2000 Magazine (http://www.windows2000mag.com) , so do a search there. I have a number of Windows computers on an Ethernet network with internet access via a router. All these pc's need access to the internet for email but only 2 should have access for web browsing. Since all the pc's have internet explorer 4 or 5 installed for access to local html files they also have access to internet web browsing. Is there a way to allow Internet Explorer to be installed on a pc yet block it's access to the internet? I've tried configuring the connection for a non-existent proxy server but the more savvy users are able to disable the setting. Any ideas? Thanks. How, do I or what is the best way to install SMS 2.0 on windows 2000 server. Microsoft says to install the service pack but their website does not tell me how to do it. Actually, all I want to do is install the admin console on a server for remote control of other computers and servers. 1. copy the entire CD of SMS 2.0 to a temp folder on your hard drive. Ensure you have around a gig left of space afterwards. 2. Download sp2 at http://www.microsoft.com/smsmgmt/downloads/sms20sp2.asp. 3. Start the file you just downloaded. After some blab-bla-bla you'll be asked for the location of your previous SMS 2.0 installation files. Enter the root of the folder you created in step 1. 4. Check if the patch has been applied correctly by examining the properties of the file autorun.exe in the root of the folder in step 1. It should read 2.0.1493.2000 for the version properties of the file. 5. Check if there are any *.tmp files left in the sms 2.0 folder from step1. If there aren't any, the patch was successful and you have SMS 2.0 SP2. 6. Burn the contents of the temp folder to a CD if you desire. 7. Run setup from the root of the folder / CD and choose to install the administration utility. I would like to add a command line to a logon script that will delete any current network shares. I think the syntax is something like NET SHARE ............. /Delete but I cannot seem to get it. Any help would be appreciated. What file do I need to delete in my registry in order to erase the password and the ratings in internet explorer. First of all, the registry, while comprised of files on your hard drive, can't be deleted like this. You have to edit the registry with a special utility called registry editor. Go to start / run and type "regedit" and press enter. But judging from your question I strongly caution you against using it... The options you refer to are implemented in one or more DLL files (dynamic link libraries) that are called upon when you press the rating button. While I could tell you the name of the file to delete, you would also mess up a number of there things since that DLL happens to be used for a number of other things as well. So I'm afraid you'll have to stick with it. This is a simple one. Your jpg graphic files are still associated with Netscape for you to be able to view them. To change this association, shift-click or shift & right-click the file and select the "open with" option. Then, select a graphics program you have installed from the resulting dialog box and be sure to select the option "always open ..." and press OK. Next time, your jpeg file will be associated with another program than Netscape. Any other files that behave like this can be changed in the same way. I bought an MP3 Wizard 2.0, but every time I try to burn a CD it says ASPI not Installed and something about a CD writer, what does this mean? To burn a CD, you need to have a cd writer or rewriter, a CD reader won't do. The complaint about ASPI not present means that you don't have the software installed that translates your request to burn a CD to the cd writer. To install ASPI for windows 9x and Windows 2000, go to the following URL: http://www.goldenhawk.com/download.htm. There, go to the aspi drivers section (around the middle of the page) and click the download link. Note: be sure to select the for 98/NT systems, NOT alpha. Then, reboot your computer. Try to make your DVD secondary master instead of slave. Upgrade to the latest versions of both media player (7.0) and easy cd creator (4.03). I'm not sure what Windows OS was in use but the workstations that I used when I was in the Coast Guard allowed multiple users to use the same station with individual settings for each by the use of user names and passwords. Would you happen to know which OS this is, and if Windows 98 SE has it, or how and if I can get it. You probably mean Windows NT workstation, which has now been superceded by Windows 2000. While Windows 98 and Me allow you to have multiple users protected by passwords, security is a big joke. I am planning on getting an Asus CUR-DLS Serverworks motherboard with a built-in SCSI controller. I am also planning on using two Seagate SCSI hard drives. What I like to known is what is the cheapest way of implementing a Raid level 1 by using the existing SCSI controller and software? The operating system will be windows 2000. Is it possible to setup software raid level one through the OS? Yes, you can set up software RAID 1 through Windows 2000, even from the Professional version. You must format both hard drives with the NTFS file system and make sure they are dynamic disks. Then you can implement mirroring. Hi, I am new to PC's. Can you tell me, please, what types of things should be on the Start Menu, and how can I find these items on Drive C: ? I shall be very grateful for any help you can give me. The start menu is used to start up your programs, perform maintenance on your computer and change various options of your operating system. Since you're new to PC's, may I suggest books like "teach yourself Windows 98 in 21 days", "Windows 98 for dummies" and the like. They will get you up to speed in no time. I am currently running Win Me (which came pre-installed) on my computer. I am now interested in updating to Windows 2000 Professional. Is this update possible? On the Microsoft website it only says that you can update from Win 95, Win 98, and Win 98SE. It never mentions Win Me. Thanks for your help. Since Windows "Millennium" (sic) has exactly the same code-base as Windows 98SE, just pop in the Windows 2000 CD and go right ahead. No, I do not think Stephan this upgrade is possible. Your OE data is stored in files that have a dbx extension. The OE address book has a wab extension. There is no need to guess or try to predict where the information is. Just go to the Tools menu, down to Options, then choose the Maintenance tab, and then click on the button that says "Store Folder." It will show you exactly where it is located. 1. Look into the tray ("the gray area") and hover over each icon with your mouse to get the program name. 3. Remove the program which name you retrieved in step 1. 4. Look in your startup folder (via start / programs / startup). Go through steps 2-3 again. The best way is to Open each program window and in the options, prevent them from starting up with windows. Programs like Real Player etc have these options in the preferences where you can select whether program should start with windows. If this option is not present, then you can use msconfig to disable some of your startup items. No need to totally uninstall them. Cannot access e-mail, all of a sudden. Message is that the DUMPSTER.ECF file is invalid......How do I down load a new one? I wish you had given a little more information. Is it web based mail/AOL mail/POP based mail and if so what email client are you using. Are you sure it is WinMe that is doing this. I feel it might be your Norton antiviral. Do you have Norton AV 2000 or later installed. If so, in its options disable email protection. It will still scan all attachments for viruses but will prevent it from scanning files on the remote server. check the connections too. See the Settings in device manager and also in the control panel. Check out your SMTP server settings in outlook express. You are possibly using more than one account and the mails that are going out are those with an account with a proper SMTP server. You have to be authorized to use the SMTP server. eg. Yahoo allows you to send only after you are logged in and receive mail by pop server. Your ISP will allow u to send mail through its smtp but other ISPs will not. So check out that. To the ActiveWin Gurus I've been using Windows ME since dec.22, 2000 and for a while I've happy for it's performance. But lately I've found a bug that when you click for example on the desktop (wallpaper that is) then NEW it seems I'll only see New Folder and New Shortcut options that I only see and no Word or Excel or Notepad and others that is supposed to there. Another one is that when you open MY COMPUTER it is slow than usual to see all the icons like floppy drive and the hard drive. What seems to be the problem here. I cannot also Restore my pc from the other day using System Restore to fix this problem easily than it should be. But I remember last week that I install Real Player 8 Basic (that I've downloaded before Win ME arrive in the market) and MS Office 2000 SP-2 the following day and also uninstall Real Player 8 Basic also the same day. I do not know if they are the ones who are bugging Win Me. Please help because I'm on the verge of re-formatting and re-installing all over again Win Me and other applications that I needed for work. Help. The options in the New File types reside in the registry and I guess its better that you stay away from it. If you do have the heart to do it, identify the file type in HKEY-Classes_Root and add a Subkey to it called ShellNew and to this subkey add a new string value with Value name nullFile and Value data "" I have attached a reg file. Double-clicking this will add a New bitmap image to your Options in the New. Try it only after you backup the registry first. Strange things happen in windows and you might end up blaming me. Or you can just open this file in Notepad to understand what I mean. as far as system restore see that it is enabled. I guess your display card is not up to the mark. Don't do refresh. Right click that box and select Show Picture. If still doesn't show..its a broken link or some problem with connection. Win NT 4.0 already contains DirectX, if I'm not mistaken version 3 or 4. Later DirectX versions only install on Win 9x or Windows 2000 platforms. The problem with NT is that the calls in programs who look for DirectX aren't always exactly returned in the way the program likes it and so it refuses to install or start. Your best option is to get into touch with the manufacturer and Microsoft, or install Windows 9x / 2000. NT4 Sp3 and later come with DirectX 3.0a, and only partial support at that. It's the only version that is supported on NT4. The only way to get 3.0a on NT4 is to install SP3 or later (which is basically required anyway since nearly everything that runs on NT4 requires SP3 or later). VXD's are virtual device drivers. They're required for Windows 9x to run and working with hardware. vmm32.vxd is part of Win9x. The other two I'm not sure of. It sounds like those three vxd's might be corrupted or somehow some improper changes were made to your registry. Your best bet would probably be to back up the important information, reformat your hard drive, and reinstall everything. I have heard of a virus that prevents a machine from shutting down or rebooting. Make sure that you have the latest virus definitions installed in your virus software, and then do a thorough scan of all of the files on your hard drive. When The Xbox arrives in fall of 2001 what would be the price of the console? Microsoft hasn't actually stated what the price will be, but it is speculated that it will be somewhere between $299 and $399. I would check your msdos.sys file in the root of your boot drive. Make sure that it doesn't say something like "logo=0"
Dear AskAW, I still have Windows 95, Pentium 233, and I went to put Disney Interactive' Who Wants to be Millionaire on it and the game didn't load right away, when it did, it said that it only uses DirectX 7 or later. I went to MS Direct X website and downloaded Direct 8. uninstalled then reinstalled the Millionaire game rebooted and when it went to start windows it gave me a message saying a file was missing in the system.ini file necessary for windows ntrr.vxd was the file name. It will start windows but now I can't get connect to the Internet because a file is missing and a lot of other things are happening. I tried to reload windows but I keep getting a suwin error message on this. How can this be fixed. Please Help. You need to find out what program installed the ntrr.vxd. It is not one of the standard Windows virtual device drivers (vxd's). Go into regedit (don't change anything) and do a search for ntrr.vxd. See if you can find out what product it is associated with. I have seen this before when the video card is having problems with its drivers. I would suggest booting into safe mode and re-installed the latest certified drivers from the video card manufacturers website. I have also seen this happen if you turn the computer on before the monitor. Some video cards need to detect the monitor before the system is even booted. Go into the "My Computer" window, go to the Tools menu (in Windows ME), and go down to folder options. Select the File Types tab and then look for the offending program in the list and delete it. I believe in Windows 95/98, it is under the View Menu, and the last item at the bottom of that menu. While connected to the Internet, I would do a Windows Update and install all of the Critical and Recommended system updates. Make sure that you are using Internet Explorer 5.5 with SP1. I like the In Place Activation feature in IE but when I try to send a page to someone, IE attaches .HTML to the end of the filename and the user gets junk. Renaming the file doesn't correct it either. For Example. We want to post Fill-in forms on our Intranet. I can click on the link and IE brings up the documents, allows me to fill it in but if I want to Route it to the next person, I have to save the document and then go to Outlook and send an attachment. I cannot use the Send page on the documents toolbar to send the document. Any ideas for easier work around for my users? I am not sure what you are referring to when you say the "Documents Toolbar". What kind of page are you looking at, and what are you trying to do with it? Hi, Before parting ways with a work issued laptop, where Win98 and Outlook Express were the standards, I copied a zip disk full of mail folders with .dbx extensions. My home machine runs Win98, and has Outlook and Outlook Express on it. How, exactly, do I move these .dbx files onto the home machine, so that the folders, messages, attachments, dates, addressee lists, etc. all appear exactly as they were on the laptop? My preference would be to go to Outlook proper, but the goal is access to these messages. Thanks in advance! You could run the import wizard in the file menu of Outlook Express. Choose File / Import / Messages and be sure to choose the correct Outlook Express version. Follow the prompts from here onward. Be sure to select your zip drive as the source of the database files. NOTE: Please note that ActiveWin nor the AskAW staff can take any responsibility for anything that may/may not occur when taking our advice. If you do anything that is included in our advice, you are doing so at your own risk. If you have any questions pertaining to a particular answer please contact the person who replied.